By the time Clay finished her senior year of high school, she had been selected as a member of the National Honor Society and had seen her basketball jersey retired. Along the way, Clay set multiple school records. She is only the second player in Girls Preparatory School history to have her number retired. In high school, ESPN ranked Clay the No. 77 recruit in her class. Although she grew up a fan of local SEC powers Tennessee and Vanderbilt, it didn’t stop her from choosing Auburn. In addition to a strong basketball program, Auburn’s pharmacy school fit Clay’s academic requirements. However, Auburn Coach Nell Fortner resigned near the end of the 2011-12 season, and Terri Williams-Flournoy was later selected to lead the program. Although Fortner had recruited and signed her, Clay decided to honor her commitment to Auburn. Clay says her transition to college was eased by her time at GPS. She had already mastered balancing school and basketball. She just needed to adjust to the speed of collegiate athletics and college life. Finding time to get to the dining hall would be her biggest obstacle. Clay scored a season-high 11 points in a win over UNC Greensboro on Dec. 14. During her freshman year at Auburn, Clay appeared in 32 games, including one start, and averaged 3.7 points, 1.4 rebounds and 1.7 assists. She earned distinction as an Auburn “Top Tiger” and was named to the SEC First-Year Academic Honor Roll with a 3.7 GPA. She also started at point guard for Auburn in its summer tour of Australia and averaged 10.5 points per game in four exhibition contests. Although she’d made strides as a freshman, Clay says she felt like Williams-Flournoy’s system wasn’t a good fit, and looked to transfer. Stollings, who was named VCU head coach in 2012, held strong ties to the SEC and had recently served as an assistant at Ole Miss. 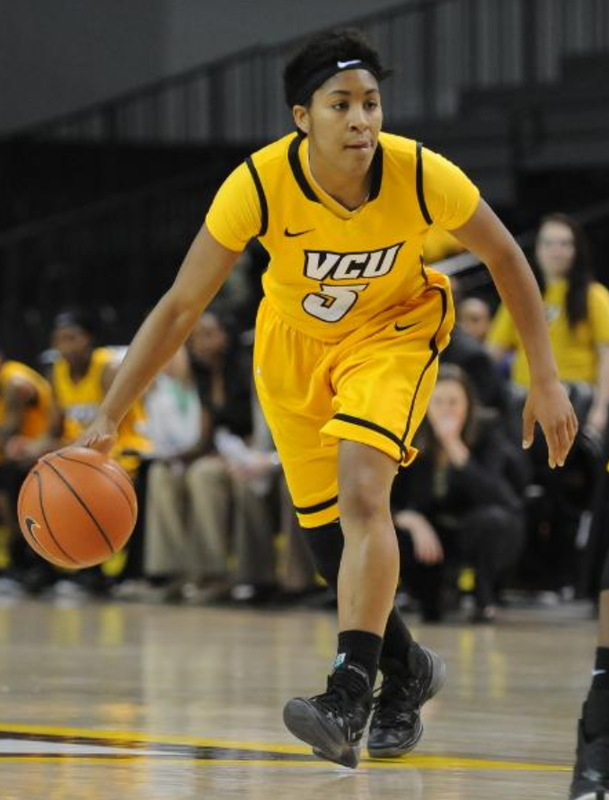 Stollings, in the midst of installing an up-tempo offense, invited Clay to give VCU a look. 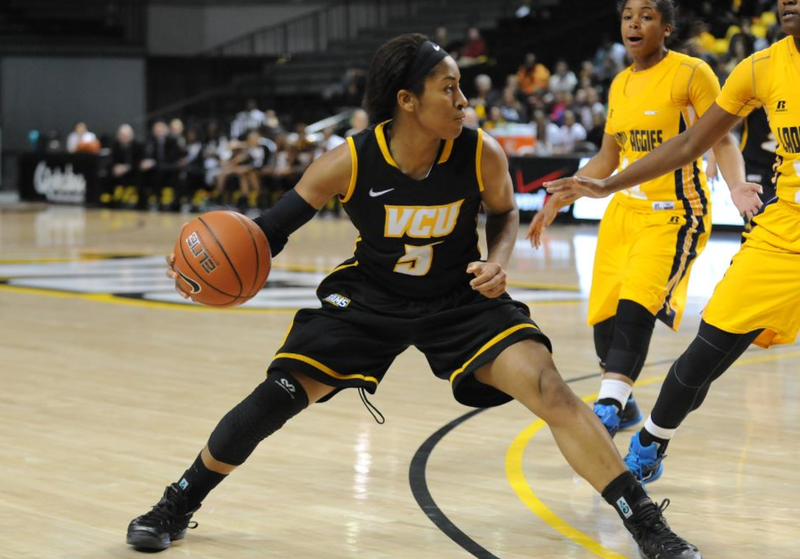 Clay says she quickly developed a bond with Stollings and the VCU players. In addition, she was happy to learn VCU had a school of pharmacy. Once at VCU, Clay wasn’t just studying chemistry in the classroom. She was enjoying it on the floor as well. Clay sat out the 2013-14 season in accordance with NCAA transfer regulations, which allowed her to rehab a shoulder injury. As the season chugged along, Clay began to miss playing. The Rams would eventually win 22 games and receive a WNIT berth. All the while, Clay longed for a return to the floor. When the team was on the road, Clay played pickup games at the Cary Street Gym to make sure she stayed sharp for her return. Ultimately, sitting out allowed her to develop the mental aspects of her game better by listening to coaches and studying offensive and defensive schemes more in-depth. Stollings resigned in April to take over Minnesota’s program and was replaced by Beth O’Boyle, who had recently led a revival of sorts at Stony Brook. Despite what would essentially be her fourth college coach in a little over two seasons, Clay took the change in stride. She says her year on the bench studying the game eased her transition from Stollings’ “Fury”, an up-tempo offense and 2-3 zone defense, to O’Boyle’s man-to-man defensive scheme and more balanced – albeit still up-tempo – offensive system. The first portion of Clay’s collegiate career provided some adversity for Clay, but she is using her experiences to make her a better player. Clay is beginning to develop stability at VCU. Through the first 15 games of the 2014-15 season, Clay is averaging 4.7 points and is second on the team in both assists and steals. Her presence has helped the Rams to a 10-5 start. Clay will have two more years of athletic eligibility at VCU. Once she completes her basketball career and her undergraduate degree, she says she looks forward to pharmacy school.